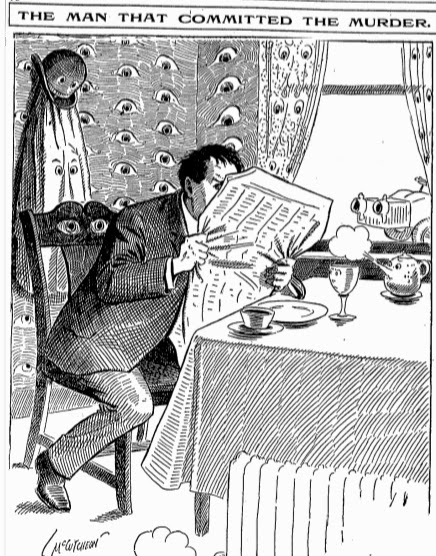 In 1904, a man who called himself “Mr. 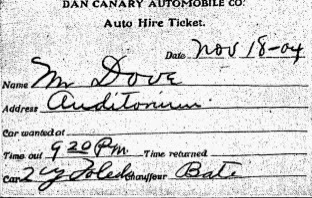 Dove” went to the desk at the Auditorium Hotel (above the still-operating Auditorium Theatre) and told a concierge that he wanted to rent an automobile for a few hours to drive to Joliet. After some hemming and hawing, he agreed to rent one at a rate of five dollars and hour – quite a sum at the time, but cars were still a real novelty in 1904, but the rental fee included a chauffeur to do the driving. That chaueffeur, John William “Billy” Bate, arrived with a car from Canary’s Garage, and the two began a long drive down Archer Avenue out towards suburbia. From here, the details get a bit fuzzy. 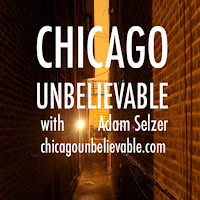 Of course, Chicago ghostlore fans will note that this ride would have taken them right by Resurrection Cemetery, as well as several other local haunted hot-spots. We even get a vanishing woman in white into the bargain here, as some witnesses (cars were enough of a novelty that there were many witnesses to the car on its journey) said that a woman in white was with them for a time. The details of the ride are fuzzy. What is known is that late that night, the car was found abandoned, with Billy Bate’s murdered body splayed out across it. Mr. Dove vanished and was never found. 1. There was an argument over the bill for the rental of the car. Bate may have been lost, and a fight may have broken out over whether Dove should pay anyway or what. 2. Mr. Dove had gotten into an argument with the “woman in white,” killed her, disposed of her body, and then killed Bate. 3. Dove and the woman were planning a crime, spoke too freely of it, and killed Bate because he’d heard everything (this was the garage owner’s theory). 4. 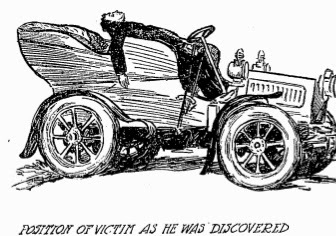 Some suggested that Mr. Dove wasn’t the killer at all, but that Bate had been killed by an irate farmer who hated automobilists. The trib noted that “automobilists, specially the riotous type of midnight tourists, are in none too good odor withe the countryside out Joliet way.” You darn noisy kids and your horseless carriages! 5. Dove was drinking, started shooting his gun off for the fun of it, and accidentally killed Bate, then fled. 6. The most common theory with the driver is that Bate’s murder had been arranged by one of Bate’s many girlfriends. Of course, some Chicago ghost hunters may have another theory: that the woman in white was the ghost we’d one day call Resurrection Mary, finally graduating from appearing aside carriages (as a mysterious woman in white was said to have done in the 1800s) to riding in automobiles, and her disappearing freaked Dove out so badly that he went nuts and started getting a bit trigger happy with his fun. Of these theories, the “jealous girlfriend” theory probably makes the most sense. By all accounts, Bate was very popular with the ladies, and the evidence in the case backs this up. He was carrying love letters from a couple of women, and pictures of another hidden in his watch. You have the prettiest eyes of brown. dimples chasing out in in. You are the sweetest boy in town. Who could help loving you? Now, keep in mind, these are just the letters Billy had on his person when he was at work. But by all accounts of the clerk at the Auditorium, Dove hadn’t been picky about who drove the car, as he would have been if he was specifically out to kill Bate on the orders of a scorned lover. Evidence soon showed that Dove had run off to Romeo, IL, in the immediate aftermath before the story broke, taking rooms and buying benzine to clean stains from his coat, and traces of him were found here and there, and one person remembered him nervously pacing in a house on Joliet Street where he’d rented a room, talking about a girl back in Pittsburgh (which is where the woman pictured in Bates’ watch lived). After trying to pay his bill, he walked out the back door towards the Rock Island railroad tracks, and was never seen again. Several people were arrested on suspicion of being Dove, including notorious con man Yellow Kid Weil, but all were eventually let go. The mystery remains unsolved. Resurrection Mary isn’t the only “vanishing hitcher” in the world; she’s not even the only one said to haunt Chicago. The south side has a vanishing girl who appears on CTA busses around Evergreen Park, for instance. And Forest Park is home to vanishing “flapper” who was said to hitch hike from the Melody Mills ballroom to Jewish Waldheim cemetery, where she vanished. Some versions of the story say that she tells drivers that she lives at the caretaker’s house before disappearing at the gates. Unlike Resurrection Mary, there aren’t many first-hand accounts of this, and there’s a bit of confusion as to whether the vanishing “Flapper” and the ghost who hitched rides from Melody Mill are even the same ghost. It seems to me that there are two different stories here that got conflated into one single one over the years. The story of a hitcher at Melody Mill (a now defunct ballroom) have been circulating since at least 1938, and possibly earlier: in 1984, Dave Hoekstra of the Melody Mill told the Sun Times about a story that had happened in the ballroom fifty years earlier in 1934: a young man named Wally met a blonde woman in a snow-white gown who asked for a ride home, and who then asked to be dropped off at Wood Lawn Cemetery. By then, though, they’d made a date. A week later, Wally went to her address, where the woman at the door said that the woman Wally described sounded like her daughter, but that she’d died three years before. How much of this is an accurate description of Wally’s tale is tough to guess – Dave heard it second-hand from Ben Lecjar, Sr, the former owner, making it a third-hand account. The story is, almost to the letter, a textbook retelling of the “Vanishing Hitchhiker” urban legend, featuring just about all of the major motifs except for finding a sweater on her grave the next day. One reason that the Resurrection Mary sightings are compelling is that, while details like going to her home the next day and meeting her in a ballroom are common in retellings of the story, they’re generally absent in first-hand accounts (there’s a bit of a distance between the story that you get from reading reported sightings and the version you usually hear when the story is retold). This Melody Mill story lines up neatly will all the motifs of vanishing hitcher legends that folklorists were identifying in scholarly articles a decade later. 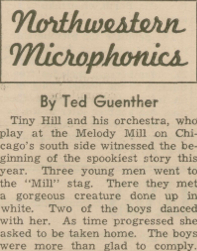 The Melody Mill story got a big boost in 1938 when Tiny Hill, the leader of a band playing there at the time, told the story of a vanishing hitcher live on a WGN radio show. Tiny’s story may have been inspired by the story of “Wally”and changed a bit for dramatic purposes, or it may be the actual source of the story, if Hoekstra was wrong about 1934 being the date when the story began. According to the radio show, three young men met a woman in white at the ballroom. She asked them for a ride home, then got out of the car at an unnamed cemetery and ran inside. Two of the young men followed her. The next day, the police found two “raving maniacs” in the cemetery, and the third man was dead at the wheel of his parked car. Investigators went to an address they found in a purse that was left in the car, and the woman at the door told them that it was her daughter’s purse, but that she had died three years before. So we can see that the story of a vanishing hitcher was common at Melody Mill in the 1930s, though it’s hard to be sure it wasn’t invented outright by Tiny Hill. Whether anyone ever really thought it was a true story in the 1930s is probably an open question. Had “Wally” really been to her home, they would know the ghost’s name, but this doesn’t seem to have been a part of the story. 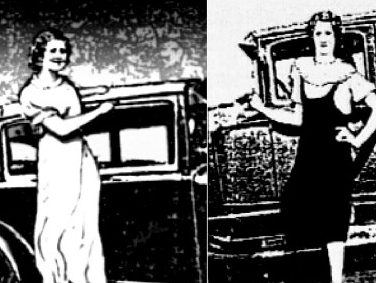 While most Chicago ghostlore studies have assumed that the vanishing flapper who is said to disappear near Waldheim and the Melody Mill hitcher were one and the same, it seems to me that we’re dealing with two different stories that simply got conflated over the years. The sightings of the ghost at Waldheim have generally concerned a young, dark haired Jewish woman in a flapper outfit. 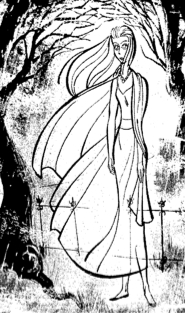 The Melody Mill hicher is said, both in reports of sightings and the fictionalized version, to be a blonde in white. Which cemetery Tiny Hill mentioned (if he mentioned one) is not recorded, but people from Melody Mill actually specified Wood Lawn. So it seems that we’re really dealing with two different stories here. There are records for several young women who died around the 1920s at Waldheim, but unlike Resurrection Mary, no theory for who she’s the ghost of have emerged. Frankly, no good theory for Mary exists, either – I never found a reliable account where “Mary” actually gives her name, or any hint of how she died. There are 60+ young women named Mary who were buried at Resurrection around the right era, and we’ve identified plenty who died in car wrecks, but stories of her being the ghost of a girl who died coming home from a dance are really pure specuation; there’s almost nothing in first-hand accounts to suggest that she died this way. From what we can actually tell, she could just as easily be one of the many, many girls in the cemetery who died of pneumonia or tuberculosis. One day soon I need to put up a proper database of all the possible “candidates” for who Resurrection Mary could be the ghost of. The internet is just LITTERED with pages that get a lot of the information wrong. Multiple people having the same name tends to create some confusion, and maybe just having ONE of these posts would cut back somewhat on the rambling, incoherent emails I get about Mary. When you get into the ghost busting business, you know that you’re going to be meeting some weirdos. One candidate whose name is mentioned now and then, but whom I’ve never mentioned here, is Mary Rozanc, whose gravestone is visible at Resurrection. She was 16 years old when she died in 1930, but little else is known about her. She comes up as a possible “candidate” on web sites now and then, though. 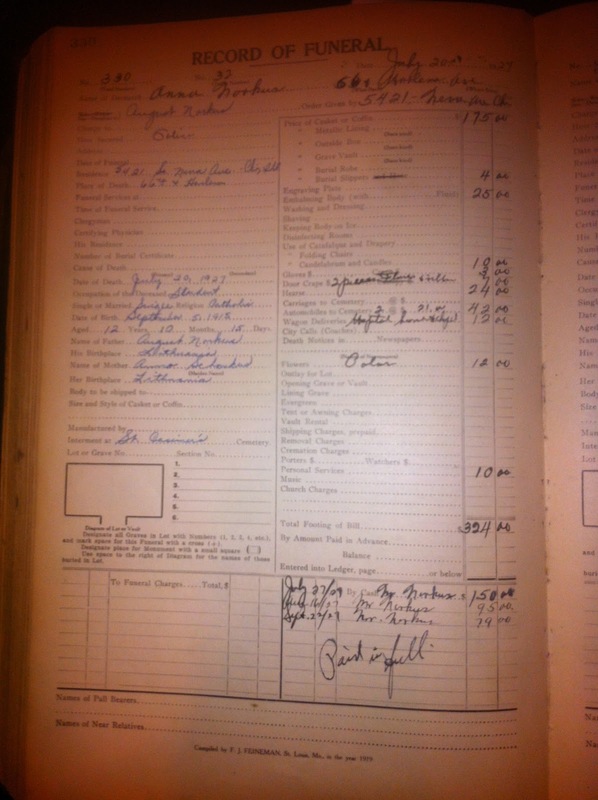 From death index records, we can see that she was born on Feb 26, 1914 and died on December 30th, 1930. Her father, John Rozanc, was born in Yugoslavia and died in 1953 at the age of 75 in Kalamazoo. Her mother’s maiden name was Jennie Intihar (also spelled Antinher in some documents). I couldn’t find an obituary or cause of death. However, a brief look at the death index indicates that there are LOTS of Marys about her age and who died around the same time at Resurrection – about 500 from a rough check of the records. A great many, perhaps even most, died as babies or toddlers (looking this stuff up gets pretty depressing); many were in their teens or twenties, but most of those for which I’ve seen a death certificate died of various diseases (pneumonia is a particularly common culprit). Mary Roznac probably succumbed to something like this. Had it been a car wreck, there would probably have been a mention of it in the papers. That doesn’t seem to be the case here. For a while I was trying to collect records on every Mary between the ages of 15 and 25 who died from about 1910-1935 and was buried at Resurrection, but the list is just too big. Now, I’m trying to narrow it down to single girls who died of some trauma, such as a car accident, which is traditionally given as Mary’s cause of death (even as a skeptic, it’s worth noting that a majority of ghost stories seem to concern people who died very suddenly and traumatically, usually due to trauma to the head or spine). I don’t know the cause of death on most of these – surprisingly few had obits in the Tribune. “Pneumonia” is a safe bet for any of them, though. Check out our recent “Resurrection Mary Roundtable” podcast and see our other posts on Mary and the various theories surrounding her. above: the famous bent bars. Last night I met with Ray Johnson, the Haunt Detective, and Dale Kaczmarek from the Ghost Research Society for a roundtable discussion about Resurrection Mary, Chicago’s most famous ghost. Is she real? How old is the story? Who is she the ghost of? Get the free episode on iTunes (or right here) now! Resurrection Mary is one of those vanishing hitchhikers; people pick her up on the South Side and give her a ride home – only to have her vanish as they drive past Resurrection Cemetery at 7200 S. Archer. We spent an hour talking about the story, its origins, and the various theories as to who Mary might be the ghost of (assuming she exists at all). There’s some new information that we’ve recently uncovered – including stories of the cemetery gates, the night the police arrested “Resurrection Mary,” what the cemetery’s records say, and a whole lot more. Mary Bregovy, (above) killed in a wreck at Wacker and Lake in 1934. Though she’s brunette, not blonde (as most sightings say), she’s become the “classic” candidate. Some suggest that there are actually several ghosts in the cemetery. Anna Mary Norkus, killed in a wreck on the south side in 1927 (the above is her original funeral record, which Ray brought with him – it indicates that she’s buried at St. Casimir, not Resurrection). Mary Miskowsik (Mary Miskowsky) , said to be killed by a hit and run driver en route to a costume party in 1930 (now disproven). We also touch on Mary Petkiewicz, a new candidate that Ray discovered, and Mary Bojacz, (above) who was killed in a train wreck while en route to a funeral at Resurrection in 1921, and the poor young women named Mary who were buried at Resurrection after dying in the Eastland disaster. “The Night It Rained” from In a Dark Dark Room by Alvin Schwartz – the Easy Reader that introduced my generation to the vanishing hitch hiker legend. The famous Unsolved Mysteries episode. Did they embellish Jerry Palus’s account? We aren’t sure he ever claimed to go to her house the next day. And here is a pdf of a 1942 article on vanishing hitch hikers – the first known scholarly work on the subject. It’s interesting to note that when the Mary story is told, elements common to these (going to the house, finding a jacket on the grave) are a part of the story. However, in practically every version of the story any of us had heard first hand, Mary simply disappears out of the car, leaving the driver confused. While we’re looking up possible candidates for the “real” Resurrection Mary, why not look back a few years further than we normally do? In 1915, when the Eastland capsized in the Chicago river, killing more than 800 people, it was the worst tragedy in Chicago history. The dead had come from all over the city, though most came from the West side, and the most notably-large chunk were of Bohemian descent (though suggesting that Resurrection Mary may not have been Polish tends to generate some pretty odd hate mail). At least five young women named Mary who perished aboard the Eastland were buried at Resurrection, and one other may have been. One was Mary Malik, age 20 or 21 (depending on the source you’re looking at), who was buried in the same casket as her 18 year old sister, Stella (their parents could only afford one – this sort of flies in the face of stories I hear about the Western Electric company bending over backwards to make sure everyone had a coffin). Both girls lived at S 3023 48th Court in Cicero. Mary was born in Moravia, Poland and settled with their parents in the Chicago area as a girl. Upon completing her education at St. Mary’s Polish school at 13, Mary got a job with the Western Electric Company and had been with them for 7 years at the time of the disaster. Stella had been working there for four years herself. 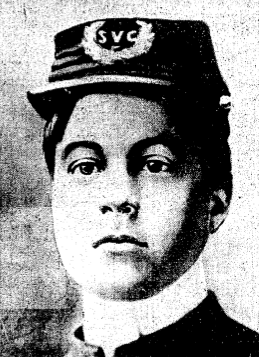 Mary Ceranek – age 17 according to modern casualty lists, though the Tribune said she was 20 at the time. She lived at 2838 S. 48th Av, Cicero, and had five brothers and sisters. She had been working for Western Electric for four months. Mary Krzyzaniak-Dudek. 27 year old wife of John Dudek – probably too old to be the ghost. Mary Kaszuba, 24. A single women who worked for the Novelty Candy Co, lived at 8042 Throop, had four sisters and two brothers. Mary Kupski (or Cooper) – age 23, lived at 2832 Lawndale Ave. An employee of Western Electric, she was the family’s only means of support, as the rest of the family was unemployed. Another -the “maybe” – was Mary Bizek (or Bezik), who was buried along with her sister Anna. The two, aged 19 and 16 respectively, lived at 2828 S. 50th Court. They had been raised in Chicago. Mary worked for Sears and Roebuck as a mail stamper, and both helped to support the family. The Eastland casualty list I consulted said that both girls were actually buried at Bohemian National, as does find-a-grave.com , though the funeral description in the Trib certainly makes it sound like it was at Resurrection. As one of the motor trucks left the church it contained two coffins. They contained the bodies of Miss Mary Malik, 21 years old, and her sister, Miss Stella Malik, 18…They worked on the same bench in the Wester electric plant, went on the steamer together, and found death at almost the same moment. A single grave in Resurrection Cemetery received their bodies. Two other households contributed two members each to the cortege. They were Antonia and Agnes Ignaszak….and Angela and Ladisslaus Latwoski… In the afternoon services were held for Mary and Anna Bizek. We don’t have photos of and of these women, as far as I know, and they died a few years before most Mary “candidates” did. But they’re roughly the right age, the right name, and at the right cemetery, which makes them just about as good as candidates as anyone else we know of. The “ideal” candidate is a blonde girl named Mary, age 16-24 (give or take), who died on or around Archer Avenue some time before about 1935, preferably after going out dancing, and was buried at Resurrection. Once again, no one fits all of those criteria, as far as we know. Of the three “major” candidates, Mary Bregovy was a brunette who died in the Loop, Anna Norkus was only 12 and buried at a different cemetery, and Mary Miskowski actually died in her 40s, not at 19, as the story goes. 1. That the ghost is real in the first place. 2. That her name is really Mary. Most of the eyewitnesses don’t seem to get her name at all. And, even if one of them did, was she giving her real name? Reading all of these obituaries is really terribly depressing. That the people in charge of the ship were never tried for criminal negligence, after adding tons of cement to the deck, raising the capacity after simply adding more life boats, etc, is simply shocking (they were only ever tried for conspiracy to run an unsafe ship, of which they were innocent). Yes, I’m familiar with the argument that the ship tipped over because the out-of-control government required it to have too many lifeboats (since the Titanic had just gone down without enough boats, prompting a handful of new regulation), but that theory doesn’t hold water with me. The added weight from the boats didn’t concern them so much that they didn’t add all that cement, and they RAISED the capacity instead of lowering it. 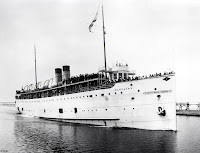 The government probably never should have allowed that ship -which was known as fussy both before and after – to be used as a passenger ship at all. For a whole lot more information and speculation, check out our Resurrection Mary Roundtable podcast! The great scavenger hunt (or wild goose chase) for the true identity of Resurrection Mary, Chicago’s famous vanishing hitchhiker, continues. Just to re-iterate, what we’re looking for here is a woman, roughly in her late teens, and probably a blonde named Mary, who died circa the 1920s or 30s and was buried at Resurrection Cemetery, most likely after dying in a car wreck, preferably on Archer Avenue. We can be sort of flexible on a number of these, partly because no one has yet been found who meets ALL of these criteria. The closest match is probably Mary Miskowsi, but stories of her death in 1930 have not yet been verified (no record or contemporary news account has been found, though census forms indicate that she was a real person). 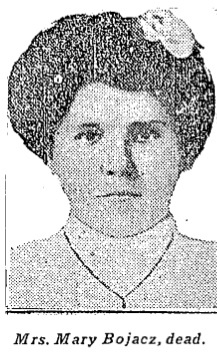 Here’s a new entrant into the field that I ran across while doing some research this morning: Mrs. Mary Bojacz, who died in 1921 in a tragic accident that claimed 11 victims, many of who were en route to burial service at Resurrection Cemetery. She’s not blonde, and there’s really no telling how old she is. The newspaper reports did not list her age, and I can’t find any other record of her yet (most likely, Bojacz was not the correct spelling of the name). All we really know about her is that she was married and lived 2658 West 25th Place. This doesn’t necessarily mean she’s too old to be the ghost, though; one other candidate was a 17 year old bride. She may not have been buried at Resurrection, though the fact that she was going there at the time of her death is an interesting twist. The accident that claimed her life was one of the most tragic I’ve seen. Two cars were headed to Resurrection Cemetery, and the car in the back didn’t see the California Limited train coming down the Santa De line as it crossed over an unguarded track at 50 miles an hour. Bodies were mangled, and parts of them, including several heads, ended up scattered as far as a mile away down the railroad tracks. All of this happened so quickly that the the front car made it all the way to the cemetery before it realized that the car behind it was no longer following it. 11 people from the funeral party, including the undertaker, were killed, and three others were injured so badly that their deaths were expected at the time the article was published. Another man was killed in another train-crossing accident that same day. Mrs. Bojacz doesn’t meet all the requirements for Mary – she’s probably too old, and certainly wasn’t a blond, but nearly any Mary killed in a tragic wreck who can be associated with Resurrection qualifies as a fringe candidate. Click the “Resurrection Mary” label below for more information on the other candidates, including Anna Norkus, Mary Bregovy (who is also not a blonde) and others. I’ll update this posting when we get a better idea of Mary B’s age. For a whole lot more information, check out our Resurrection Mary Roundtable podcast! The Haunt Detective recently put forth another possible candidate for the identity of Resurrection Mary: Mary Petkiewicz. Mrs. Petkiewicz was only 17 when she was killed in an auto wreck on Christmas, 1932. In an accident at 55th and Cicero (the northeast corner of Midway airport), she was crushed to death when a car (driving by the brother of a local beer boss) rolled on top of her. Very little about Mary P. is known, other than the fact that her husband’s name was Casimir. No marriage between Casimir Petkiewicz and a girl named Mary is in the Illinois Marriage index. Another girl named Mary Petkiewicz married a man named Stanley Bieszczadt in early 1934, but this seems to be unrelated. The newspaper only tells us that she was a young wife (a few of the retell ins cropping up call her a “bride,” which sort of creates the false impression that it was her wedding night), and that she was 17 years old. Her maiden name is unknown, she doesn’t seem to appear in the death index, and I’m not sure she was buried at Resurrection Cemetery. Perhaps they weren’t actually married yet, and her last name had not actually been changed. However, she’s the right age, certainly existed, and was only a few blocks from Archer Avenue at the time of her death. It doesn’t TOTALLY line up with the Resurrection Mary story – in the classic version of the ghost story, the driver went to her mother’s house and found that the girl had died years before. Being married, Mary P probably wouldn’t have given her mother’s address as her own in the afterlife. But who knows? UPDATE: Ray tells me that he’s now determined that Mary P. is not at Resurrection. Further Update: Albert Petkiewicz, Mary’s great nephew, has confirmed that Mary was married to Casimir, his great uncle. The other folks in the car that night were his paternal grandparents, Alexander and Anna Petkiewicz. They’re gone now, but for about thirty years an important part of Chicago ghostlore was the bent gates at Resurrection Cemetery. Two of the gates were bent, as though someone had tried to pry them apart, with scorch marks where the hands would have been. The story went that a man had been driving past and saw a woman holding the gates and screaming. He reported to the police that someone was locked in the cemetery, and they arrived to find no one there…only bent up bars. The cemetery’s explanation was always that a work truck had backed into the gates, and the scorch marks came from blow-torching them in attempt to bend them back into shape. Resurrection Mary fans scoffed. A year or so ago, I was signing books at a large annual conference of writers, librarians, and teachers. A woman came up to me and introduced herself as the daughter of the guy who backed into the bars – she even said she’d seen the accident report. While it’s always been said that the cemetery was terribly embarrassed by the bars, and outraged that people would blame a ghost, according to her it was always sort of a running joke to the cemetery maintenance staff. The “ghost bars” were considered particularly hilarious. Now, this is the part where I must hang my historian head in shame. I didn’t get NEARLY enough information from the woman. I was working at the time, and and in the process of divorcing myself from my old company and unsure whether I’d ever work in the ghost business again. All that can come of this is that I can say that I’ve heard from presumably trustworthy sources that the cemetery never took the “ghost bars” seriously, and were quite secure in their belief that it was all the result of a construction accident. For a whole lot more information, check out our Resurrection Mary Roundtable podcast episode! We discuss the bars at length.